“We must work on the institution of an International Opinion Tribunal for the new desaparecidos of the Mediterranean Sea”. This is the provocative call made by Enrico Calamai, former Italian vice-consul in Chile and Argentina during the dictatorship and, today, front-line activist in the field of migrants’ rights and awareness raising for the victims of the Mediterranean Sea. We have met him for an interview about his quite unique idea. The call to start a new session of the Permanent People’s Tribunal focusing on the thousands of deaths of refugees and migrants in the Mediterranean was well received by the participants of the Social Forum 2015 that took place in Tunis a few weeks ago. Several associations from both the northern and southern Mediterranean coasts have declared their pledge to work on collecting depositions by relatives, friends and spouses of the migrants who lost their lives in the Mediterranean, in order to create “a solid and coherent corpus of depositions to use as evidence before the Court”. The functioning of Permanent People’s Tribunal is very similar to any other International Tribunal; however, it is not granted recognition as an official Court. Therefore, the sessions taking place in this Tribunal instead aim to “raise and focus the interest of public opinion on significant human rights violations and crimes against humanity”, with the final objective starting a similar legal procedure before an official International Court of Justice. 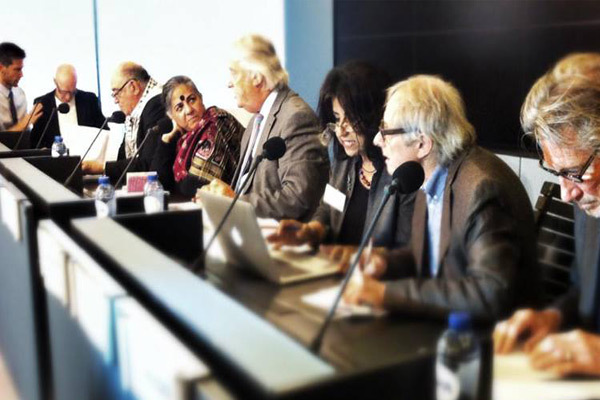 To date, six sessions have been hosted by the Permanent People’s Tribunal; the first one, and probably the most famous one, was constituted in Sweden in 1966 by the philosophers Bertrand Russell and Jean-Paul Sartre to condemn the war crimes perpetrated by the US in the Vietnam War. Enrico Calamai believes that international law is the “only tool that civil society can take advantage of to condemn who perpetrates crimes against humanity and to stop the impunity of those responsible for such violations”. In the case of the victims of the Mediterranean Sea, the accused part in the process would be composed of “the European governments and NATO”, responsible — in Calamai’s words — for designing and implementing during the last twenty years a political and operational system aiming at blocking all sorts of migratory fluxes towards Europe. The former vice-consul maintains that the refoulement operations do not stop in the Mediterranean but rather take place also “in Libya, in non-democratic countries on the North African cost, in the Horn of Africa with the Khartoum Process and in Western Africa with the Rabat Process”. “Failure in duty of care” of the migrants crossing the sea by boat and “neglect as a strategy of deterrence”, despite the “great surveillance and assistance devices in the hands of the European States and NATO in the Mediterranean area, such as radar, helicopters, satellites, drones”: these are some of the most incriminating statements made by the Italian activist. Calamai looks at the migrants, then, as a new category of desaparecidos who are victims of a “deliberate non-action” of the European governments: the concept of desapariciòn is therefore understood as a political method to elude the public’s awareness of the ongoing tragedy of the Mediterranean Sea. “It is foremost important then”, says Calamai, “that European public opinion becomes aware of what is going on and the International Opinion Tribunal will work to achieve that”. “Europe’s Gatekeeper”. Amnesty International’s insight on asylum seekers’ detention in Turkey Legal Entry Channels for asylum seekers to be boosted according to FRA Report Want to be a migrant for an hour? Art can help you do that. Medex Museum’s latest experiment.